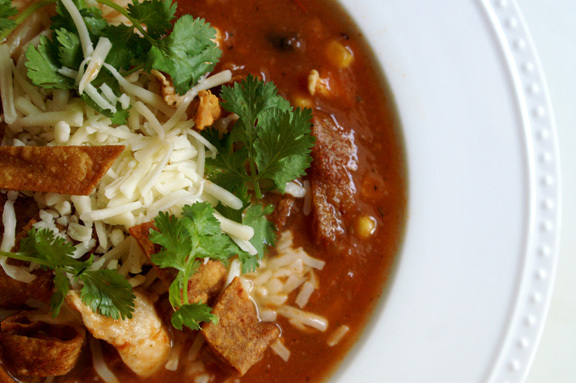 farmers’ market monday: loaded chicken tortilla soup. I am calling this Farmers’ Market Monday, but one could argue this may be anti-Farmers’ Market Monday. Not one thing came from the farmers’ market, and I’m not ashamed. I have made more apple and pumpkin and squashy things for you and for myself these past few weeks that I needed a bit of a palate cleanser. I’ve noticed many of my blogger friends have done the same, so I say let’s take a little holiday for a minute. A tropical vacation, if you will. This was our first very cold weekend here, so soup was in order, and I wanted chicken tortilla. With lots of stuff. Although this didn’t come from items found at my own farmers’ market, I would imagine it all came from someone’s. 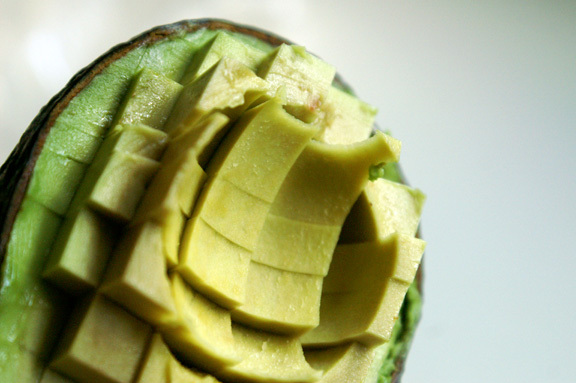 There’s fresh avocados. Fire-roasted tomatoes, black beans, and corn. Fresh lime and cilantro. Grilled onions. Can you stand it? No. And everyone needs a little break in the action from our gourd-filled wonderlands, if only for a meal. I’ve been wanting to make this for a little while now. It’s from my Williams Sonoma Soup Cookbook, which is a pretty great collection of very straightforward soups. Favorite thing about it? It’s fun messing with things that are straightforward, because it gives you a solid, comfortable base to work from. I added lots of other things to it to make it more of a vegetable soup, which in turned lightly thickened the broth; a welcome trade-off rather than using cream or any sort of thickening agent. I added some jalapeno juice for a little more oomph (which adds a depth, but not too much heat), and topped it with fresh avocado, cilantro, and Monterey Jack cheese. But there’s more. I’m happy to say I fried my first actual thing with this. Like filled-a-frying pan-with-oil-and-dropped-things-in-it frying. It was thrilling. Why haven’t I ever done this before? Because when I was growing up, my mom made it her life’s mission to instill in us the knowledge that mostly everything could indeed kill us if done incorrectly. Certainly this taught us to be cautious and think things through before doing them when we were kids. However, it’s now carried over into adulthood and manifests itself in funny ways, like when a 35-year-old grown adult just knows she’ll set the entire house ablaze if even one drop of water gets within 3 feet of hot oil. Thanks, Mom. I overcame that fear this weekend whilst frying my corn tortilla strips; always good to start small when counteracting your mother’s twisted way of keeping you safe, I think. So, baby steps. Corn tortillas are super easy to fry, they only take a few minutes, and there’s no massive popping involved. I was so buoyed by my tortilla-frying achievement that I got fancy and dusted them with a little smoked paprika and squeezed some limes over top as they cooled. And, most importantly, no one was maimed. This is a great soup to have in your pocket. Not literally, as that would be messy and you’d probably get strange looks from your friends, but it’s good to have this in mind when you feel like taking a little mid-winter vacation. 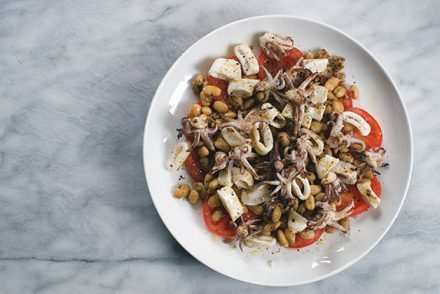 It doesn’t make a crazy amount, either, so it’s just enough for a family dinner or for two over the course of a weekend, with a little leftover for a weeknight meal. You should know, finally, that I make no claims on this being authentic in any way. I know next to nothing about authentic Mexican fare, and I want to learn more. If you want some thoroughly real Mexican cuisine, go see my friend Jen at Juanita’s Cocina; surely she temporarily detests me for throwing her dreaded black beans into soup (she prefers pintos.) I’m sorry, Jen. I’m issuing a very public request here for you to check your inbox because I miss chatting with you as of late. Obviously the black beans may deter this. Adapted, with many liberties taken, from Soup by Williams Sonoma. Williams Sonoma no longer keeps this one in stock, so I’ve linked it on Amazon. It’s been replaced at WS by the much larger and very interesting Soup of the Day: 365 Recipes for Every Day of the Year. I have an immersion blender, and I thank the moon and stars above that I do have one every time I make soup, because it makes everything easier. If you don’t, you can use your food processor to blend everything together, but if you’re a frequent soup-maker, or you’d like to be, an immersion blender is worth every penny. Heat 1 tablespoon of your oil in a large frying pan over medium heat. 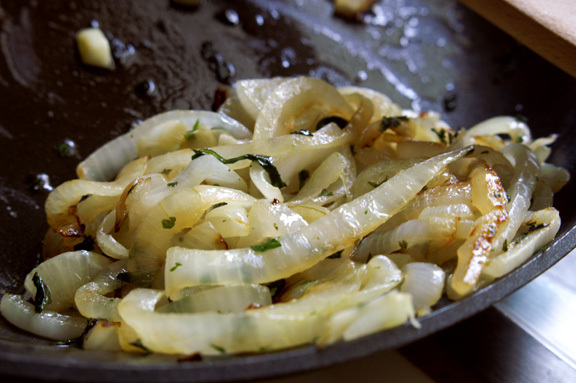 Add your onions and the 2 tablespoons cilantro and saute until your onions are starting to brown, about 8-10 minutes. When they’re almost done, add your garlic and cook until garlic is fragrant and not burned (careful! ), stirring constantly, about 30 seconds. In the same frying pan, add the other tablespoon of oil, and add your tomatoes and cumin to the mix. Stir together and let cook, stirring frequently, until your mixture has thickened and is slightly darker in color, about 6 minutes. At this point, food processor people, take your mixture and pour it into your food processor. Pulse until mixture is smooth and no chunks remain. Transfer the mixture to a large saucepan over medium heat and add your chicken stock and jalapeno juice. Cover partially and bring to a just-boil, then turn your heat down to medium-low and let simmer, stirring occasionally, until your soup thickens and has reduced slightly; this should take about 20 minutes total. Halfway through this cooking time, add your corn and beans and allow to heat through. At the end of your cooking time, add your chicken strips and continue to simmer, stirring occasionally, until they are opaque, 3-4 minutes. Season with salt and pepper to taste. 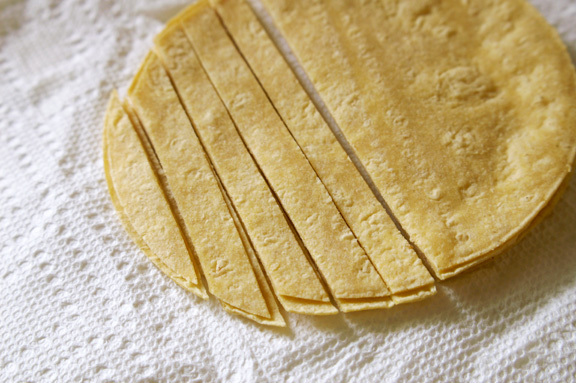 While your soup stands at the ready, make your tortilla strips. In a large, deep frying pan, heat your oil. 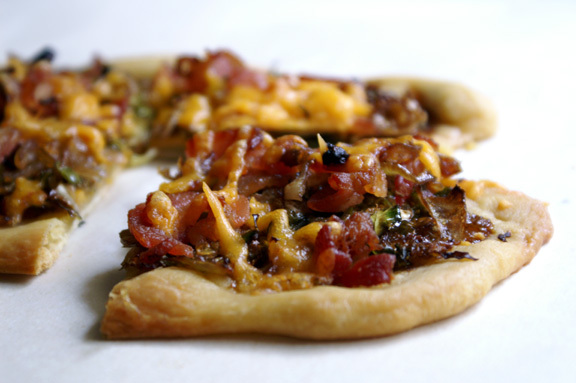 Use a tortilla strip to test it; if you drop one in and it sizzles immediately, it’s time to go. Drop handfuls of the strips into your oil and fry, turning with tongs, until browned and chip-like, about 3 minutes. Remove them with tongs or a slotted spoon, tranferring them to a wire rack covered with paper towls to soak up excess oil. While your tortillas cool (and you can do this when they’re all finished), dust them lightly with your paprika and squeeze a little lime over them. Totally optional, but I enjoyed the flavor it added to the soup. To serve, ladle the soup into low bowls (if you have them) and top with avocado, cheese, and tortilla strips. Garnish with a wedge or two of lime and some cilantro. Serves 4-6 and will keep happily in your fridge for up to 4 days, tightly sealed. agreed: i can’t read about food when i’m hungry (it’s a rule that i don’t look at your posts either, especially the burger ones) at the end of the day either: it’s like going to the grocery store when you haven’t eaten. BAD. IDEA. 🙂 fun, but bad when you come home with things you don’t need, like donuts or random snacks. at least this is semi-good for you? and it so IS like an AZ farmers’ market right now! you should make this soup; then i can truly call it (natalie’s) farmers’ market monday. dang it! i should have called it that. I’ll eat it. Black beans and all. Also, your e-mail is forthcoming. When I have time away from the two new furry babies. Yes, I said two. you will? really? aw. 🙂 thank you…i know how much you do NOT like the black beans. yay! i’ve been seeing the Teaser updates and have been concerned about how Toots is handling the situation…hopefully well. i trust everyone’s fur is intact. but is there another?? oh no. 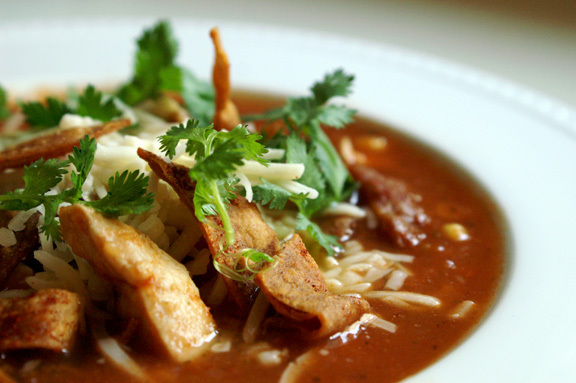 Tortilla soup is so on my to do list. We’re waiting til we get our Hatch green chiles! Also, THANK YOU for putting something in my RSS feed that was not apples, squash, or pumpkin! It’s only the second week of October. Yikes. I love the idea of putting jalapeno juice in the broth. Genius! My mom almost burned the house down with a grease fire when I was a kid. NO WAY am I deep frying anything, ever. I’ll leave that to the guy and go sit in another room. hatch chiles! everyone talks about those, and we don’t get them here (or we do, rather, but you really have to time it right and seek them out.) you are so welcome! i’ve been going apple and pumpkin crazy here, and although i’m happy about it, everyone needs a little taste bud break or it all starts to run together. that jalapeno juice trick? totally snagged that from Andrew Carmellini; he does that a few times in the American Flavor book. So many people that I’ve met are SO AFRAID of deep frying! Including my mother:) What is it with that generation? Oh, kitchen safety you say….. not so bad I suppose. I love this soup, although I’ve never thought to add jalapenos to the broth – very clever! thanks! 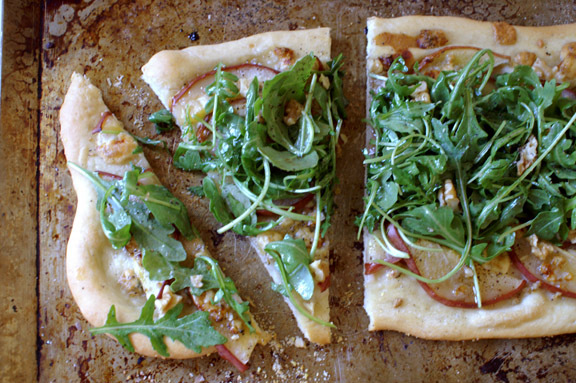 you’ll see this, but i just told Brianne it’s all Andrew Carmellini: he does it with a few of his dressings/sauces in the American Flavor cookbook, and i love what it adds to dishes. i’ve snagged the idea and applied it to other things, and it fits in beautifully, but he gets the credit for turning me onto the idea. I even know what lefse is! i call it Nordic Naan. 🙂 i wonder if the Mexican culture ever thought they’d ever hear that being uttered (“making mexican a bit more nordic”) bet not. This one time when I was young my mom was cooking on the stove (not frying, just cooking), and I was doing homework at the table a ways off. Some sort of thing in the stove ignited… or something… and suddenly there were huge sparks, and pieces of charred and flaming food, flying all across the room and over to me at the table. That was the day our oven died. Mmm, kitchen safety. so, let me get this straight: at some point in your life, you had like, flaming food hurled at you from an almost kitchen fire? honestly, it’s a miracle any of us survived in the seventies and eighties. I almost died from a sparking toaster oven. AND WE BOTH SEEM TO ENJOY COOKING. sickos, we are. Hooray for conquering frying!!!! You give me strength and courage, dear lady! I have much to do to follow in your trailblazing footsteps – play with a kitchen torch, fry stuff in oil…! I also love the idea of adding pickled jalapeno juice. I can’t get enough of those spicy, vinegary slices, so it just makes sense to use their juice too. ashley, you calling me a trailblazer is a huge compliment. 🙂 i enjoy trying new things, but it takes me a bit to work up to it and get my confidence where it needs to be; it’s my personality to think my way through something completely before trying it, if that makes sense? so it’s been great interacting with you and others who give me that confidence and help me get there; so thank YOU. same here! i love that vinegar bite and heat from the jalapenos, but adding the slices seemed like it may overpower such a delightful soup; the juice is great to use in sauces/dips/dressings when you want that tartness and a slight heat, but you don’t want jalapeno stamped all over it. it works in a great background way where people won’t necessarily be able to pick it out, but they know something is really kicking the flavor into high gear. it’s a neat trick. The flavors here sound incredible – love the the jalapenos, and the avocado on top. I’ve made tortilla soup once, but it didn’t taste as good as this one looks. Will definitely try yours next time! Just the other day I told my mother, Rosie Beaucoup, that I wanted to fry donuts on the stove in a big pot of oil and she basically lost her mind. Growing up, we were told time and time again that hot oil will kill you and the entire neighbourhood in a fiery blaze, and that candles will always – ALWAYS – burn your house down. (Oh, and never – NEVER – leave the dishwasher, slow cooker, dryer, or washing machine on if you aren’t at home.) Is it any wonder that I invented my almost-famous home SECURITY CHECK? That I’m a ball of neurosis? Sigh… Though, she’s probably right. rosie beaucoup sounds quite a bit like my own mother, who made sure all candles were out approximately 59 times before leaving the house. Our house never burned down, so she assumes it’s due to her fire saftey methods. Mom also had rules regarding the appliances listed above, and an additional one regarding bathroom exhaust fans, which evidently could catch fire (because they would overheat, i think? it was A FAN) if left on for any length of time. Here’s to mothers who inadvertently cause their children long-term anxiety over dryers and slow-cookers. they were probably right. let me go back in now and make sure the slow-cooker isn’t on. oh do it! I waited too long to make mine, and i regret not having made this sooner. Probably it’s the perfect thing to un-jangle your nerves after a long day at school. sweet + salty rosemary party nuts.